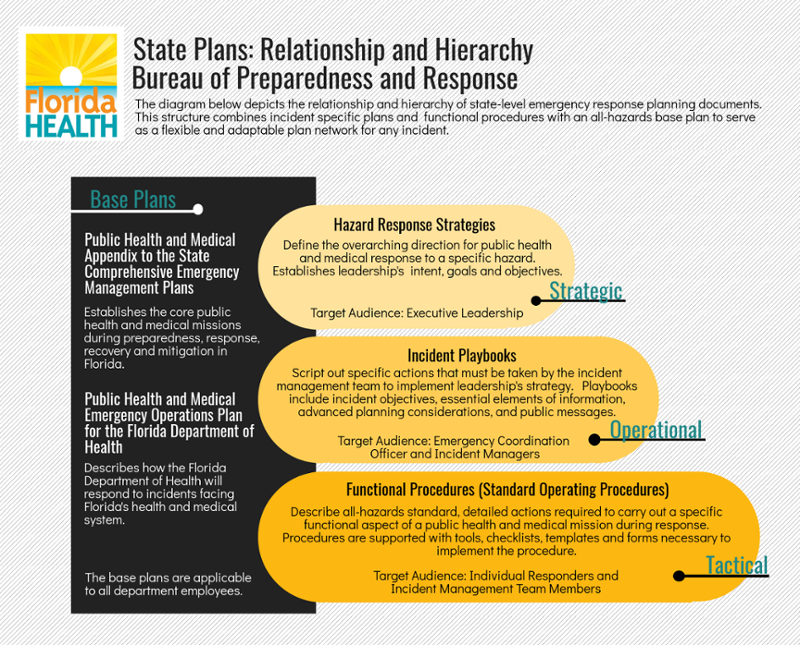 The Department of Health is the lead agency for Florida’s Emergency Support Function 8 (ESF 8) – Public Health and Medical Services. ESF8 coordinates the development and maintenance of plans, procedures and resources as a part of the State Emergency Response Team (SERT) to ensure Florida can meet a core set of operational missions. Core Mission Implementation Plans: The Public Health and Medical Appendix to the State Comprehensive Emergency Management Plan (CEMP) established 11 core missions for the public health and medical system during a response. Specific plans and procedures addressing the implementation of the core missions during a response are in the following categories. Core Mission 1: Support local assessment and identification of public health and medical needs in impacted counties. Core Mission 2: Coordinate and support the stabilization of the public health and medical system in impacted counties. Core Mission 3: Support sheltering of persons with medical and functional needs. Core Mission 4: Monitor and coordinate resources to support the care and movement of persons with medical and functional needs in impacted counties. Core Mission 5: Support monitoring, investigating and controlling potential or known threats and impacts to human health through surveillance, delivery of medical countermeasures and non-medical interventions. Core Mission 6: Support monitoring, investigating and controlling potential or known threats to human health of environmental origin. Core Mission 7: Develop, disseminate and coordinate accurate and timely public health and medical information. Core Mission 8: Monitor need for and coordinate resources to support fatality management services. Core Mission 9: Monitor need for and coordinate resources to support disaster behavioral health services. Core Mission 10: Support responder safety and health needs. Core Mission 11: Provide public health and medical technical assistance and support.